This project aims to respond to the need of inadequate and contaminated water supplies in 3 villages by coupling a solar pumping water system with community hygiene promotion and training in community water management. Bolivia, like many developing nations, is greatly affected by the lack of clean drinking water. Globally, contaminated water is the second greatest cause of infant mortality and an estimated 1.8 million children die each year as a result of illnesses linked to the consumption of polluted water. (PNUD 2002). In Bolivia, the quality of water in rural areas is extremely limited. According to Water for People, “2.3 million Bolivians do not have access to safe water (approximately 75 percent of the rural population) and the majority of people that do have access to water have an inadequate water service in terms of quantity, quality, and continuity.” The lack of access to safe water is a major causal factor of many health problems. For example, diarrhea causes 36% of deaths in children under 5 in Bolivia. Chronic diarrhea is associated with and contributes to chronic malnutrition as well. At the same time studies prove that the provision of potable water and sanitation facilities can reduce deaths from diarrhea by 65% and overall childhood mortality by 55%. In November of 2012 staff members from Etta Projects and technicians from Always On Solar conducted a feasibility study in Bolivia to assess the viability of mechanizing the water systems in four communities with a solar, photovoltaic (PV) pumping system. The team studied the current potable water systems in four communities, collected demographic data and conducted interviews with families to determine the water requirements and the willingness of the community to participate in and take ownership of the projects. Technical data was also collected to understand the physical characteristics of the wells and boreholes and the solar resource at each site. The results of the feasibility study showed that three of the four communities currently have limited access to potable water and could greatly benefit from solar electric pumping systems. Monterey is an indigenous community located approximately 100km (6 hr drive) from the city of Montero in the Municipality of Santa Rosa in the Integrated North of the Department of Santa Cruz. There are 45 families and 30 houses. Residents’ primary language is Quechua but Spanish is also spoken. The community borders a forest reserve and the area is dominated by large soy farms and the timber industry. General living conditions are extremely poor and the community is only accessible by road in the dry season. The community has expressed interest in a solar pumping system and is willing to provide all the necessary labor for the installation of the pumping and distribution system. They are also willing to form a water committee and pay a monthly tariff for water use. Until 2010 the residents of Monterey shared a shallow, hand dug well located in the center of the community. A borehole was drilled in 2009 by H2O S.R.L and a hand pump was installed by Etta Projects. Residents estimate that each family uses approximately 6 buckets (180L) of water each day which is carried to their homes. Additional water is used on days that they wash clothes. The water from this borehole is used for drinking and washing. It is not metered and used freely. Guadalupe is located about 9km from Monterrey. It is also is an indigenous community with residents’ primary language being Quechua but Spanish is also spoken. There are approximately 30 families in the community which is dispersed over an area of about 8km. In the central area there are approx. 50 residents living in an area within 100m of a central plaza. The central plaza contains a school and a health clinic. General living conditions are extremely poor and similar to those in Monterey. The community is only accessible by road in the dry season. The community leader expressed an interest in a PV pump, especially a localized distribution system. Community members who live in the central area currently get their water from a hand dug well, estimated to be 10M deep. In the more remote areas families have their own hand dug wells that appear to be shallower. There is currently no water tank or distribution system. A borehole was drilled approx. 400M from the central area in 2009 by H2O S.R.L and a hand pump was installed by the municipality. The community used the hand pump for a short period of time but complained that the water was dirty. The pump was damaged by the dirty water and removed. Since then, the borehole was cleaned by the Prefecture and capped because there was no longer a working pump available. The community does not use the borehole. El Abra del Astillero is a Quechua community located high in a mountainous region 9km south of the town Moro Moro (approximately 8 hours from the city of Montero). Moro Moro is the location of the municipality and health center. The road to El Abra del Astillero is long, rough and steep. El Abra has a total of 80 families, aprox. 250 residents. There is a local school with 55 students. Residents of El Abra claim that the local population is shrinking because of lack of access to potable water. Approximately 400 meters from the town center of El Abra is an artesian well located down a steep embankment off of the road into town. Water flows out of the ground at this location and large concrete catch basin. From the basin water trickles into a secondary, smaller basin where it is gravity fed to a public tap-stand in the community. There is considerable seasonal variation in the amount of flow. At the time of this feasibility study, the dry season, water flowed at approx. 3.75 liters/min. Residents claim that most of the year the flow is considerably greater. An NGO, MMC (Mennonite Central Committee) has been doing work in Moro Moro and the surrounding communities. In March of 2012 a 12,000L tank was installed alongside the road, uphill from the artesian well. A pipe was buried from the tank to the well. In addition, a water distribution system was designed and installed from the tank to the community. Currently, 39 families are connected to the distribution system as part of Phase I of the water improvement project. However, the large tank was never connected to the spring because there is no means of pumping the water from the spring to the tank. In addition, two 3500L black tanks were purchased and brought to the site. Plans were put into place to use these tanks as a secondary collection area to pump the water from. Currently the tanks are not connected. This project aims to respond to the need of inadequate and contaminated water supplies in the three indigenous villages with a solar pumping system and promotion of WASH activities. The new water systems will provide a sufficient supply of clean drinking water to community members while eliminating the need for on-going fuel expenditures as well as maintenance and reliance on an unreliable grid. Once communities are serviced by solar powered pumps, they will enjoy ownership of the system and direct control over its power and function. They will also be introduced to a technology that fosters a sustainable energy ethic. Lastly, the project will encourage behavior change through hygiene education and promotion. All three schools will be connected to the water distribution system. All families benefiting from the water system are expected to participate in the education component of the project. Additional training will be provided to the teachers and will target students. Water Committee Training: Each of the three villages will elect villagers to serve on a local water committee. The local water committee will be responsible for ensuring that families properly use the water system, conserve water, pay their tariffs regularly and practice healthy hygiene habits. Water Committee Members will receive special training that includes: Water Committee Structure & Organization, Roles & Responsibilities, Financial Management; Mobilizing the Village; Water Quality; Hygiene; and Technical Operation and Management of the Water System. The training sessions will spread over 6 months. Intensive trainings with all three committee will be held in the city of Montero with supplementary, hands-on training in each village. Water committee members will receive a 3-day technical training on solar powered water system. It will be held at Etta Projects office in Montero, a central area so water committee members from each community can attend. At the very least, three members of the water committee must attend the training program. The program will focus on the operation, maintenance, troubleshooting, repair and replacement of the PV pumping system components. Training programs will also cover broader information dealing with electricity, safety, tool use, etc. Trainees will install the PV pumping systems under the direct supervision of AlwaysOn technicians and Etta Projects’ staff. The project will implement PV (Solar) powered electric water pumping systems and water distribution systems (where applicable) in the three communities Monte Rey , Guadalupe and El Abra; all which currently do not have adequate access to potable water. Solar electric pumping systems were chosen for a number of reasons. Bolivia has a good solar resource and the system designs use proven and dependable technology to pump sufficient quantities of water without the use of expensive fuels or unreliable grid power. Unlike many conventional pumping systems, the solar pump can operate unattended. The design is simple; when the sun is shining the pump is pumping water. There are very few moving parts which alleviates the need for continued costly maintenance. The system essentially contains three main components: The solar array, a controller, and the pump. The array consists of four to eight solar panels mounted on a pole. The electricity generated by the solar panels passes first through the control box where it is regulated before energizing the pump. The pump may be a submersible well type pump (which will be used in Monte Rey and Guadalupe) or a surface water pump. 1. Monte Rey: The community will be responsible for constructing a water tower. The tank will be approximately 10000 liters in capacity to provide the community with 1.7 days of usage. The project will install a PV array on a pole or ground mount in the area around the pump. The community will construct a security fence around the borehole and PV array. A distribution system containing up to 1000M of 2 ” PVC pipe will be installed so potable water will be available within 6m of each family’s property. It will be the family’s responsibility to fund and install the final section of distribution piping, meter and tap stand on their own property. 2. Guadalupe: The community will be responsible for constructing a water tower. The tank will be approximately 10000 liters in capacity to provide the community with 1.7 days of usage. The project will install a PV array on a pole or ground mount in the area around the pump. The community will construct a security fence around the borehole and PV array. The project will install a limited distribution system, approximately 600M of PVC pipe that will service the central area of the community in the vicinity of the school and health clinic. A public tap stand will be installed in this area, and families in the concentrated area will have the option of paying the additional costs for their domestic connection. This design will also allow expansion of the distribution system in the future to service individual homes. 3. EL Abra: Approximately 1/3 of the families of EL Abra have already been connected to a water distribution system, although the system is not currently operational. The village has already purchased water storage tanks as well. This project will install a PV array on a pole or ground mount in cleared area within 100M of the pump. The community will construct a security fence around the borehole and PV array. Upon completion of the pumping system any interested community members currently not hooked up to the distribution system could connect under the management of the water committee and the local municipality. Extension of the water distribution system in El Abra is not funded in this project. The details of the technology, technical summaries & recommendations, and information on Bolivia's solar resource can be found in the feasibility study in the Attachments section. The project will be done in specific phases. Please see the Phase document and a project calendar in the Attachments section. The participating communities have solicited support for a water system from numerous organizations over the past years. These villages proposed a unique challenge due to the lack of electricity in the villages. Consequently, Etta Projects identified a partnering organization, Always On Solar, to combine efforts and expertise in order to effectively respond to the communities’ water needs. The communities have agreed to take on a number of responsibilities in the project that will promote ownership of the water system. Each of the three villages will elect villagers to serve on a local water committee. The local water committee will be responsible for ensuring that families properly use the water system, conserve water, pay their tariffs regularly and practice healthy hygiene habits, thereby administrating the functions and sustainability of the system. All families will sign a contract agreeing to pay the monthly tariffs and abide by the community water policy. The community is also responsible for providing labor and materials towards the water system. They have agreed to install the new tanks and the water distribution system. The community will also construct a security fence around the borehole and PV array and install a large steel pole that will be connected to the solar panels to prevent theft. Lastly, additional involvement from the village includes: attending community meetings and allowing home visits, participating in training sessions, helping to maintain the water system, and practicing hygienic behavior and sanitation. Each of the two local municipalities (Municipality of Moro Moro and the Municipality of Santa Rosa) will make a financial contribution toward the water equipment and will attend training sessions. They have also agreed to support monitoring and evaluation of the projects’ sustainability. The Ministry of Water and Environment is working alongside the project to approve tax exemption on all materials and equipment that are entering Bolivia from the U.S.
A financial structure will be developed within the communities to assure that funds are available if parts need to be repaired or replaced. The water committee will collect monthly payments for water service from water users and teach families the importance of making regular payments. This system will be established by a local water committee. The level of payment and the conditions of use will be agreed upon at the start of the project before implementing the system. A constant funding stream ensures the feasibility of the water system. The financial contribution of each family gives the community a larger stake in the sustainability of the water system and encourages families to maintain and repair the water system when there are problems. 1. 155 families (approximately 500 people) from three villages will have access to safe, reliable water. Verification: The Project will count the number of households that have a functioning water faucet at the end of the project. Tools used will be direct measurement and direct observation. 2. 95% of the participating families will report satisfaction of the water system. Verification: The Project Coordinator will interview all participating families and assess levels of satisfactions. Verification: Baseline date will be collected before the project and compared to data collected at the end of the project. The same monitoring tools will be used during each evaluation phase. Tools include direct observation, interviews, and photographs. 4. The project will be locally managed and sustained after the grant period. Verification: The Project will count the number of families that have a functioning water faucet 3 and 5 years after completing the project. The water committee will be responsible for all maintenance incluing cleaning dust/dirt off the modules, tightening nuts and bolts on the racking system, cleaning the tank periodically, checking electrical connections, and repairing leaks in plumbing. The community's successful management of the pumping system and ability to generate income to buy replacement parts (like a new pump or controllers) are good indicators of the success/sustainability of the project. Please see uploaded budget for details of project expenses (please note, the first tab shows a detailed list of all project expenses and the second tab shows a summary of expenses and the partnership contributions). This project has secured: $46,419 from Rotary International and a commitment from the Ministry of Water & Environment in Bolivia $2,162.90 toward customs fees.In addition the Municipality of Santa Rosa has designated $1,100 towards the distribution systems. Both the Municipality of Moro Moro and the Municipality of Santa Rosa have already provided funding towards the water wells. Each of the three communities will contribute manual labor towards building the water tank and fence as well as installing the water distribution system. Families from El Abra and Monte Rey will also pay for the domestic hookups to the distribution system. Community members will also pay for ongoing use and maintenance of the water systems. Always On Solar will be responsible for the technical support of the solar powered water systems. Always On Solar’s projects use solar energy to improve living conditions and promote clean, independent and sustainable power sources to meet community energy needs. Always On Solar is dedicated to the successful implementation of sustainable projects. In addition to technical support in project design and installation Always On Solar fosters community training and education. A team from Always On Solar provides the training needed to assure long term sustainability of the solar project.Always On Solar provides technical expertise, designs and materials for solar energy projects such as: water pumping and purification, electricity for hospitals and medical centers, school lighting and power and other projects that enhance quality of life and benefit communities. To ensure project sustainability and promote the growth of jobs and a local solar industry, Always On Solar provides extensive technical training classes to local technicians, community members and nonprofit organizations. Classes focus on electrical basics, the installation and maintenance of solar energy systems and small business development. Would you be able to give the characteristics of the Grundfos SQF pumps you are planning on using? (diameter, head, flow rate, efficiency) for the applications you have in mind for the three communities and with the expected voltage range from the solar panels? Thank you. Would you be able to give the characteristics of the Grundfos SQF pumps you are planning on using? (diameter, head, flow rate, efficiency) for the applications you have in mind for the three communities and with the expected voltage range from the solar panels? Thanks for detailed project proposal. Since the situation and context of Geographical, Geological and Social in India & in Bolivia is very different, therefore it is very difficult to capture all the details narrated in the proposal. However, your answers to Mr. Rob Beli of El Porvinenir’s queries help to get deeper understanding of the situation and project. I have one question that- since the solar system will be imported from USA, whether the solar energy operated pumps are commonly used in the country? If yes what are results and experience? The secondary focus of the project is to address the health and hygiene issues through capacity building and promotion of WASH activities. What about the construction of toilets? Do you have any plans to address these issues in future? Thanks for the questions. Purchasing the materials in the U.S. was a tough decision, since we always try to buy local materials. We have selected to use Grundfos pumps because they are available internationally and used throughout the world. We first got quotes in Bolivia for the pumps and the quotes showed prices more than two times the cost for the exact same unit it the USA. The quotes we got for solar panels in Bolivia had prices more than four times what we purchase them for in the USA. I attached some quotes from ProSol Energia in Santa Cruz and Vicom Bolivia in La Paz in the attachment section of the proposal. We originally wanted to purchase the pumps in country, but could not justify the added expense to our other donors in the project. As far as your second point, Rob brought up a similar comment above. Again, we recognize that sanitation is an important piece of a WASH program. Most families currently use a traditional pit latrine, although in El Abra some families have ecological latrines built a few years ago by a different organization. Etta Projects currently implements a sanitation program using double-chamber ecological composting latrines. Unfortunately, due to funding constraints as well as time and distance (these villages are very remote), Etta Projects does not have the capacity to implement its sanitation program in this upcoming project cycle. I want to emphasize that our hygiene promotion in the project (offered in all three villages) will address what families can do to their current model to improve sanitation. As I said to Rob, our approach usually has us stay connected to the same village for a number of years, and our goal will be to implement a sanitation program there is the future. We have a track record of offering the villages where we work access to water and sanitation, and we are confident we will accomplish this in all 3 villages in the following years. Thanks for a detailed application and responses to questions, it has helped to give me a good understanding of the projects. I have a few questions to help clarify further some details. 1. (for Monte Rey and El Abra) You mentioned a $93 connection charge, is this per household, and if so, is this affordable to the community, particularly the poorest? If not, do you have any plans to assist the poorest households to connect to the system? 2. (for Monte Rey and El Abra) With the potential shortfall in water availability from the well, do the households currently collect water through other methods, i.e. rainwater harvesting? 3. (for El Abra) You mention that MMC have been working in the area, however, you also mention it is not clear who has designed and installed the existing system. What steps will you take to ensure that you are not interfering with another organisation's project? 4. (for El Abra) What is the reason that you are not planning to extend the system to the remaining households, where will they get clean water if you disconnect the public tap? 5. (for El Abra) How is the water source protected to ensure water is not contaminated? 6. (for all sites) Have you looked at the costs of operating and maintaining the system against the potential income? Have you discussed with the community what they are willing to pay for the water supply? In Guadalupe, you have mentioned concerns about the sustainability, do you have any suggestions about how the community might be able to finance the operation and maintenance costs? 1. (for Monte Rey and El Abra) You mentioned a $93 connection charge, is this per household, and if so, is this affordable to the community, particularly the poorest? If not, do you have any plans to assist the poorest households to connect to the system? • Flexible payment plans. We work with families to set a payment plan that is comfortable for them. • Families can work for their project instead of making a financial contribution. They are required to work 5 days in order to work off the full financial contribution in this specific project. Etta Projects provides opportunities such as supporting the latrine construction of our sanitation program to work off their loan. 2. (for Monte Rey and El Abra) With the potential shortfall in water availability from the well, do the households currently collect water through other methods, i.e. rainwater harvesting? The Solar water pump in Monte Rey will pump approximately 11 gallons (44L) per minute. A conservative estimate of 3.3 hours of pumping would deliver 8,712L per day. This exceeds the 6000L/day requirement of the community. Hence, the water source in MonteRey is adequate and does not need to be supplemented by an additional source. In El Abra, the population has been declining because there has not been adequate access to a water source. The public tap stand was the only water source at the time of the feasibility study. Recently, additional tanks have been installed with a temporary diesel pump. This has increased the storage capacity and the availability of potable water in the community. 3. (for El Abra) You mention that MMC have been working in the area, however, you also mention it is not clear who has designed and installed the existing system. What steps will you take to ensure that you are not interfering with another organisation's project? This project was managed by PROASU JICA (a branch of the prefecture) with partial financial support from MCC. MCC no longer works in the Municipality of Moro Moro, and this is precisely why PROASU JICA requested support from Etta Projects. Our staff in Bolivia visited the office of MCC in Santa Cruz and learned that the institution supported water and sanitation projects (eco latrines) in the area. They confirmed they no longer work in the Municipality of Moro Moro. In addition we have been coordinating with the Municipality of Moro Moro throughout the planning of this project. They explained that only two NGOs currently work in the Municipality both support agriculture projects. No private organization is working in water and sanitation. 4. (for El Abra) What is the reason that you are not planning to extend the system to the remaining households, where will they get clean water if you disconnect the public tap? It is not in the scope or budget of this project to extend the water distribution system in El Abra. The original project (conducted by MMC) did have this plan but ran out of money. The community will be working with the municipality to design and extend the system if necessary. We have no plans to disconnect, connect or change the public tap stand. Again, the distribution system in this community is the responsibility of the community and the municipality. In El Abra, we were asked to pump the water into a tank so they have the ability to distribute it. 5. (for El Abra) How is the water source protected to ensure water is not contaminated? The water source in El Abra is an artesian spring that flows out of the ground. The water committee has installed mesh sediment traps and "leaf guards" to prevent organic debris from entering the tanks where the water flows in. Etta Projects implements an entire training program (both at the community level and with the water committee) to help them understand the need to collect tariffs and secure the financial resources needed to maintain the system. The common tariff system is set at 15 Bs. (about $2.20) for 5 m3 of water and an additional 3-5 Bs for every other meter cubed. Based on our experience with past water projects, families have been able to pay this. At times families pay late, but on rare occasions is a family’s water sgut off (which is 3 unpaid months). In Guadalupe, we are working with the community to set up a system where they pay a common flat fee depending on the type of user they are. Again, there needs to be community buy-in to the system for this to work, since it will be more difficult to prevent families from using the community system. I hope this helped to answer your questions. Let me know if you have any additional concerns. For wells that have not in the past provided as much water as presently planned two tests a necessary in principle. The first is quite feasible and it is the draw down: you pump out water rapidly and observe how soon the water in the well returns to its previous level. This, the project planners have done. The second, designed to determine whether the aquifer is sufficiently ample to provide water for a whole year cycle requires hydro-geologique data and is generally pretty impractical except for larger projects- so that one cannot blame the originators of this project not to have carried it out. Which does not mean that as Rajesh points out that there is a question there. On the other hand I am a little short of technical information about the details of the solar-panel pumping system design. The efficiency of the system depends on the proper mating of the pump characteristics and of the circuit to which the pump is connected. These are not given so that it is not clear what fraction of the electrical power output of the solar panel can in fact be used to do the pumping. I am also bothered by the fact that this project postpones to an indeterminate future the hygiene inherent in latrines. Improvised latrines ( a pit dug in the ground and a piece of plastic around it) are better than no latrines at all. But 1. what % of the population actually does own one? and 2. Probably that is not used anyway by young children. Finally the details of the distribution network design are not given. I realize that I have not given much time for the project sponsors to answer- I have been delayed by too much urgent work. Thanks for the questions. Please know that I am not ignoring you- Etta Projects is partnering with the organization AlwaysOn Solar, and I’d like to get their input since they were present during the feasibility study. Unfortunately, they are participating in another project and have not been able to respond. For now, I uploaded specific parts of the feasibility study that respond directly to your questions, particularly to the pumping calculations for each site and the performance curve of the pump we are using. Did you have the opportunity to read the feasibility study in full? It responds to many of your questions. 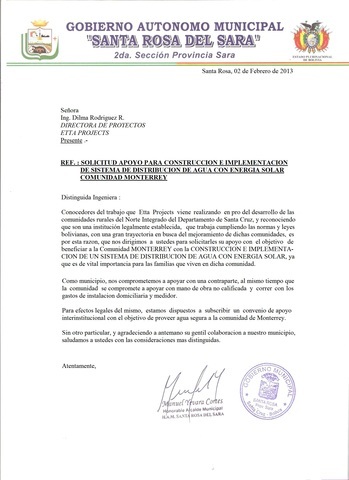 If not, please check it out in the attachment section “Bolivia Feasibility Solar Water Final”. It also includes some recommendations for the distribution systems that have since been finalized. I have also attached the technical data book for the grundfos pumps which provides lots of technical info regarding solar pumping systems that you mentioned in your first questions. I completing understand your concern about sanitation. Our education program has a large focus on both hygiene and sanitation. These are not topics that are overlooked. Our plan is to implement dry composting latrines in each of the villages, a model we have had much successes with in the past and have almost always coupled with our water projects. Given the distance of these villages, it is not feasible to do it within the same year. In the interim, our project includes a series of interactive activities that focus on hand-washing, personal hygiene, household hygiene, and sanitation. Our sanitation topics look at the current situation and possible low-cost, realistic solutions for improvement. I know the Q&A period will be shortly closely, I’ll try to be in touch beforehand with more details. I hope the new documents and the feasibility study help to answer most of your concerns. Thanks again for the input on our project. For Guadalupe, the proposal indicates 47 families and a population of 50 people. is this really the case? the feasability study indicates that the required water is 1000 l/day based on 40 l/person/day, which implies 25 people. Can you clarify? thanks! For Guadalupe, the proposal indicates 47 families and a population of 50 people. is this really the case? the feasability study indicates that the required water is 1000 l/day based on 40 l/person/day, which implies 25 people. Can you clarify? The village of Guadalupe has caused a lot of confusion, mainly because the entire village has 47 families (according to gov't documents) but only 50 people live in the concentrated area. These 50 individuals will be the main beneficiaries of the water system. To make matters even more confusing, I just realized that there a typo in the table... the system in Monterrey is identical to the system in Guadalupe. The system in Guadalupe will provide aprox. 6000 liters per day (1585 gallons per day) which would be enough for 140+ people. I apologize for the confusion!!! For Gravity flow systems, the tank sizes you indicate are more than adequate. However, for solar pumping systems is 1.7 days of storage adequate? it seems quite likely to have periods of several days without direct sun. How is this typically handled by others? If there is an extended period...days of rain..there may be limited amounts of water available due to low pumping levels....however, with all that rain there will be less of a demand for water from the well. The Bolivia solar resource data (appendix III) is interesting. The interesting point I observed is that the dry season (June - Aug) is cloudy and hence has solar insolation reduced drastically ! (this is unlike India - insolation is maximum in summer). On the contrary, they get rains during hot seasons. This, in a way, reduces the stress on water demand, as it is available when required most. Bolivia experiences minimum solar insolation of 3.31 kWhr/sq.m/day (June - dry but cloudy) and maximum of 5.57 kWhr/sq.m/day (Nov - hot but rainy). The panel size is calculated based on minimum insolation. During other seasons, the pump will provide either more water than required or has to waste the solar energy. The variation of water production of SQF 2 during a day (in January) is from 0.15 cu.m/hr to 1.16 cu.m/hr. The pump is rated to deliver 1.16 cu.m/hr and rarely runs at full capacity. The above illustrate the over sized pump and wastage of solar power. Our design would allow for using the excess solar energy for other applications like community lighting. The pump would also get optimally sized. Our design will give a capex gain of 10-15% on the solar materials (roughly $500). We can talk about this after peer review. I was talking with the solar team on this project regarding the comments provided about your solar expert. Our PV sizing calculations are always conservative and the systems have been intentionally sized larger than the minimum requirements. The monthly Peak Sun Hour (PSH) values used to size the PV system are monthly averages. Even during the months with the most solar irradiance there may be periods of many cloudy days with lower than average sun intensity which equates to lower pumping capacity. You also must consider that the output of solar modules degrades over time and water demand and community size are expected to grow. Furthermore, we want to reiterate that this PV pumping system design is DC direct. There are no batteries and there is no electrical storage. Excess solar power cannot be used for lighting or any other electrical load because there is no way to store the electricity. AlwaysOn Solar does this intentionally. Batteries reduce the efficiency of the system, add considerable expense and require maintenance. Even under optimal conditions batteries will most likely not last more than 5 years. Our technical partners agree that they usually never recommend using batteries on a stand-alone pv pumping system for a community water system. Hope this helps build a better understanding of the project. I look forward to more dialogue over these projects. Hi, thanks for your proposal. Can you please explain whether/how the water source will be re-charged? Thanks for the question. Reading the pump test reports attached to the feasibility study we see recommendations for installing pumps into these wells. The recovery rate in Monterey is more than 200 liters per minute and in Guadelupe it is more than 180 liters per minute. We are proposing to pump about 50 liters per minute. The recovery rate of the well is more than adequate for the proposed volume of water. In the case of El Abra del Astillero we will only be pumping what the artesian spring delivers to a tank. The system will be unable to extract more water than the spring can provide. Recovery rates change after time (usually for the worse). Our borewell's recovery rate has dropped dramatically over the last few years as our community has over exploited. Our water table has gone down by 200' !!! I believe Dipti was asking (if not, i am asking) for what is the recharge rate for the aquifer. Any hydrological studies on groundwater and its recharge? How much rain fall does this area get? As Rob has observed, making people carry water, even a short distance dramatically improves conservation. This is where we have to introduce rural practices into the urban space rather than the other way around. One way we could enforce this is that people with domestic connections pay more. Brings me to my question: what is the plan with the meters? Who is going to read them and track them (PWX can be used to track each meter)? Who is going to charge for usage? I see you have mentioned the committee in the metrics section, but please expand. What is the pricing plan? How long will it take to raise enough to replace panels or motor (failure rates are different) as you have mentioned? Thanks for the comments. I'll respond to both your inquiries here. A hydro-geological study of the aquifer has not been conducted at these sites, and the cost and practicality of one is beyond the means of this project. Our data and calculations are based on the drawdown tests conducted when the bore-hole was drilled, the estimated water demand of the community, the water storage and pumping capacity and limits, and the local meteorological and solar irradiance data. It is a legitimate concern that water can be over-pumped and over consumed when a bore-hole is mechanized, especially with diesel pumps or grid-powered pumps that have the ability to run all the time. This is even a greater concern when the water is not used exclusively for human consumption and diverted for irrigation. If the resource is scarce or limited it might make sense to force people to haul water to prevent over-consumption. However, we do not believe this is the case at our sites in the Amazon Basin, and our project is designed so that women and children can reduce the time they spend hauling water so they can focus on other opportunities to improve their lives. The solar pumps used in these projects have a limited pumping capacity. They are limited by the physical characteristics of the pump itself, the depth of the water source, and the solar resource. The water available to the community is also limited by the capacity of the storage tank. These limits, in addition to the metering and tariff structure that the community will implement (I detailed this in the above), will ensure an adequate supply. To give you an idea of possible aquifer recharge rates, consider the hottest months of the year; October-January have the highest mean temperature and the highest levels of solar irradience (brightest sun). These are typically the months when water consumption would be the highest. These are also the months when the solar pump will pump the most water. Historical meteorological data at the sites shows that these are also the months with the most precipitation (aquifer re-charge) peaking at nearly 200mm in the month of January. Let me know if you have any other questions.. Thank you again! Thanks Katie. Please respond to the q's on meter and revenue. Sorry about the delay. Each community decides their own pricing plan. We train and encourage communities to adopt the recommendations of the Ministry of Water & Environment, which is a base tariff of 15 Bs per month per family (about $2.20) for 5 m3 of water and an additional 3-5 Bs for every other meter cubed. In Monte Rey the project will serve 30 homes. If each family stays within the base tariff each month, the water committee will collect at total of $66/month or $792 per year. In Guadalupe the project will serve 10 homes in a concentrated area, plus any other families that agree to the monthly tariff that live on the outskirt. If each of the 10 families stay within the base tariff each month, the water committee will collect at total of $22/month or $264 per year (plus any additional families that choose to contribute). In El Abra the project will serve 80 homes. If each family stays within the base tariff each month, the water committee will collect at total of $176/month or $2112 per year. The pumps we purchases cost $1900. The pumps come with a 10 year warranty. We suggest a five year plan to accumulate the funds for pump replacement (it will take slightly longer than that in Guadalupe). The solar panels we purchased for each site cost a total of $610 for the three 235 watt modules for a total of 705 watts. The modules come with a warranty of 25 years and we recommend a 10 year plan to accumulate the funds to replace the modules. (It should be noted that the pump will still work at a lower lever with just two of the three modules). Thanks for submitting this project, although I have to admit I am somewhat of a solar skeptic, although we did pilot one here about 1-2 years ago. Although it is still working, I am still not convinced of its sustainability - I'm not sure the community will be able to maintain it, especially as pumps and panels need replacing. 1. In several places, it talks of 3 vs 4 communities, what happened in the 4th? 2. The workplan doesn't seem to include community involvement in solar installation, although AlwaysOn talks of always training local community members. Is there a plan for the transfer of this knowledge? 3. What is the % community financial contribution in each community? I see a letter talking about the municipal contribution as well, what % are they planning to contribute? 4. I don't see anything about sanitation in the proposal, what is the current sanitation situation in these communities? If they are not covered, what are the plans to do so? 5. There is talk of the warranties in the document for the panels and the pump. Does the warranty cover lightning strikes, for the pump especially? Lightning is likely the most common problem and/or theft. (although the pump can burn out as well if the well goes dry). What are the plans for these types of problems? 6. Give the numbers in Monterrey, the plan for 40 litres per person per day (ppd) seems too low. The current usage comes out to 54 litres ppd and having water close always prompts much more water use. I would recommend planning on at least 100 litres ppd. There is plenty of water, but your tank may be too small. I am no engineer, but perhaps Gilles or others may have thoughts on that. 7. The community of Guadalupe (and Abra) talks of 148 people for its calculation of water needed, but that is the number from Monterrey. 50 people it says are there (although later it says there are 47 families and 47 people, very confusing). In this case, likely overdoing it on the calculations. In any case, for such a small community, I agree with the study's assessment that this is not likely sustainable. I'd have to recommend against the project in Guadalupe. 8. In Guadalupe, it is mentioned that the well was capped when the hand pump broke and also that people complained that the water was dirty. Has water testing been carried out on these wells/water sources and can you share the results with us? 9. The water source in Abra will only produce 5400 litres per day, giving you just 21 litres ppd - much too low. What plans have you come up with to overcome this deficit? Thanks so much for taking the time to thoroughly read the report. I appreciate the questions and the dialogue around this project. As I said, this solar powered water project is a pilot project for Etta Projects, and we really look forward to the opportunity to learn from other organizations such as El Porvenir that have more experience with this technology. As we all know, there is no one model that fits the needs of all communities. Community members from Monte Rey and Guadalupe have been petitioning for support from Etta Projects towards a water system for the past four years. When comparing solar to other options (i.e. generators that run off diesel fuel) the use of solar for pumping seems like the best alternative in these villages that have no access to the electric grid to power mechanized pumps, mainly because of their low running and maintenance costs. 1. In several places, it talks of 3 vs 4 communities, what happened in the 4th? A number of communities were visited and assessed during the feasibility study, all potential candidates for a PV pumping system. The list of visited sites was narrowed down to 4 possibilities. El Abra, Monterrey, Guadalupe and Molle Avaora. Molle Avaora had a working water system that was very well managed. However, the community had very high maintenance costs associated with running a generator to pump the water. A PV system at this site would have reduced maintenance costs but not necessarily improved the pumping and distribution of the system. Given budget constraints we decided that the remaining three communities were better candidates. 2. The workplan doesn’t seem to include community involvement in solar installation, although AlwaysOn talks of always training local community members. Is there a plan for the transfer of this knowledge? Community involvement is instrumental to the success and sustainability of this project. As stated in the proposal, all communities will be responsible for forming a water committee. The committee will have a minimum of five community members. The water committee members from all three villages will travel to the city of Montero (where Etta Projects’ office is located) to receive a three-day in-depth training on the solar technology, installation process, use & maintenance of the equipment, troubleshooting and repair of their system from two solar engineers (both are Spanish speaking). Later, the engineers and members of EP will travel to each of the villages and work with the entire village during the installation process. The community members will install the systems themselves under the supervision of our technical team. During this time, a series of community meetings and workshops will be held to discuss the water system and its proper use and maintenance, ensuring the transfer of knowledge to the community. The communities will own their systems and be responsible for operating and maintaining them. Etta Projects will make continual visits to the villages to monitor the sustainability of the equipment and water usage in the village. Members from AlwaysOn also have plans to make a follow-up visit in 2014 to monitor the sustainability of the equipment and respond to any community concerns or doubts regarding the system. The % of community financial contribution differs in each village. In the villages of Monte Rey and El Abra, where we will be implementing domestic connections at each household, each family will pay for the cost of the water faucet, their water meter and the 6 meters of tubing that connects to the distribution system. The total cost of all the material to make each domestic connection is $93.43. Both Guadalupe and Monte Rey are still in need of a water tank. Both villages have agreed to build the structure of the tank (which they are currently making based on recommendations from the group of engineers and from technicians from the local municipality). The plastic tanks will be provided by the project, but the community will provide the base. In addition, local community members are providing the manual labor to support the implementation of the distribution system, the solar panels, the fencing and the steel poles. Both municipalities agreed to invest in the project. Currently the municipalities are in the process of formalizing their annual operating budgets (unfortunately, the local government’s schedule often does not correspond directly with our grant cycles). The Municipality of Moro Moro has already made a large financial investment in previous years to the infrastructure already in place in the village. In Santa Rosa, the municipality has agreed to support some of the costs of materials for the distribution system (totaling $1,100). If any additional funding is secured once the annual operating budgets are finalized, the project partners have agreed to use it to purchase replacement pumps that can be used if any problems occur with the original pumps. The first stage of this program primarily focuses on water and hygiene promotion, although we realize sanitation to be instrumental in a WASH program. Most families currently use a traditional pit latrine. We recognize that this model poses many challenges, particularly during the rainy season. In order to improve this situation, Etta Projects generally promotes double-chamber ecological composting latrines. Unfortunately, due to funding constraints as well as time and distance (these villages are very remote), Etta Projects does not have the capacity to implement this water project simultaneously alongside its sanitation project. I want to emphasize that our hygiene promotion in the project (offered in all three villages) will address what families can do to their current model to improve sanitation. Themes such as community sanitation, hygiene and basic sanitation and handwashing will also be addressed during the workshops. Please know that Etta Projects usually stays connected to villages for a number of years, and our goal will be to implement a sanitation program there is the future. We have a track record of offering the villages where we work access to water and sanitation, and we are confident we will accomplish this in all 3 villages. Lightning strikes or other "acts of God" are not covered by manufacturer warranties. The PV systems will be installed with grounding and lightning suppression systems that are designed to mitigate the damage caused by lightning strikes. However, it is impossible to completely prevent the possibility of lightning strikes and a direct strike will damage components regardless of how well they are protected. The communities will devise income generating means (through a tariff system) to save money for the repair or replacement of components if they were to fail. Also: The pumps being used are equipped with a "dry-run switch" which automatically shuts down the pump down if runs the risk of running dry. A security fence with a locked gate will be constructed around each PV array and bore-hole to prevent access by unqualified people or theft. Tamper proof hardware will also be used. I have directed this question to our partners at AlwaysOn Solar. I am no engineer either, and would like their input before responding. I should have an answer in the near future. The numbers above are from an earlier draft version of the feasibility study. Guadalupe is a community that is very spread out over a 10km area. 30-47 families can be considered to be living in Guadalupe depending on where you draw the line. A cluster of 10 families live in very close proximity to the bore-hole. Community members currently draw contaminated water out of shallow, hand-dug wells at their homes or in the central area next to the school and health clinic. This project aims to install a public tap-stand that provides clean water from a drilled bore-hole in the central area of the community. The community members have agreed to finance and install a distribution system that will bring the water to people leaving farther away from the central tap-stand. For this reason, the system was intentionally over-sized. The bore hole was cleaned and re-tested by PROASU-JICA, a government agency: the results are included in the appendix of the feasibility study. There is considerable seasonal variation in the amount of flow. At the time of the feasibility study, the dry season, water flowed at approx. 3.75 liters/min. Residents and municipal representatives claim that most of the year the flow is considerably greater and there has never been a shortage of water. Given the nature of the community's water source, the community may need to conserve water during the driest times of the year. Thanks again, Rob. I hope this helped to clear up most of your concerns! I just heard back from our partnering organization, AlwaysOn Solar. The solar engineers added some additional information to a few of your concerns that I would like to share. “The community is also responsible for obtaining the materials and constructing the tower upon which the tank will sit. They have already obtained the materials and ingredients for concrete. Both Monte Rey and Guadalupe say they will have the towers completed by the end of the month. They are also responsible for trenching for the water distribution piping system. The community is also responsible for the installation of a fence around the solar array and controls to provide security for the solar array and pumps. We used very conservative estimates on the volume of water produced per day for the feasibility study. We have found on past projects to allow the community to build its plans around the lowest month of water extraction from the well. After the feasibility report was presented we decided to add another solar module to the pump and estimate that the volume of water pumped to the tank in June would be about 9000 liters which translates to 46 liters per person per day assuming a population of 195 people. In the highest volume month the pump would be capable of providing 16,000 liters per day which translates to 82 liters per day per person assuming a population of 195 people. Past projects that we have completed used the World Health Organization’s minimum daily water requirements for 20 liters per day per person. We hope to provide double this amount during the rainy season and four times this amount in the dry season. See the attached production estimates based on the pump manufactures calculations for our proposed system in Monte Rey. The pump we are providing is capable of pumping four times the volume of the lowest flow period during the year. During the months of higher flow from the spring the pump will be able to deliver this water to the community’s distribution system. In this location we are working with a natural spring that the community has already tapped into and built tanks and a distribution network – so we are really just responding to their request to lift the water to a higher tank so they can then use gravity to feed it to their village. They are currently using this spring, tanks, and distribution system by borrowing a generator and pump to move the water. But the costs of fuel and the fact that they do not own the generator leaves them in a position that they cannot sustain. Thanks again, Rob. I hope this helps clear up your concerns. 3. Community contributions: The number you quoted $93 for one community sounds good, maybe even higher than ours in some cases - that's great! 6. I still suspect it may be a touch low, but perhaps Gilles or someone has better knowledge, My vague impression is that 20 litres from WHO is a minimum and based on any type of project. What we have found over the years is that when it is a well and people have to carry the water, they use much less than when it is piped and more easily available. Your own data was what made me bring it up, they collect more water ppd from the well than in the low season would be pumped. We plan for 14 gallons ppd for a pumping system with public spigots and about 20 gallons (80 litres) for home spigots (my engineer thinks in gallons) as a minimum all year round (when possible, sometimes your water source doesn't allow it). 7. Still seems a bit dicey to collect enough funds, but I will take your word for it. 8. That'll teach me to ignore the appendices. Thanks. Good water. 9. The engineers talk about pumping water, but if the source hasn't got enough water, being able to pump more doesn't help. I suspect again you could have water shortages and potential conflicts there. 1. Appears to be good advance work in the communities. 2. Local government support and involvement. 1. Appears to be Etta's first go at solar pumping. Good proposal and takeaways from the Q&A. The project has a few questions - it appears that Etta is ready to tackle them, learn, and share. Seeing their use of PWX for regular reporting, i think this project would be good for all members on PWX to watch and discuss (would folks be interested in having Q&A around projects, similar to what we have around proposals?). This is likely to be a good project, I am just a touch worried about the water production numbers on two of the communities, but I hope I am wrong... Good luck with the project! It is a good model of the Public Private Civil Society partnership. It meet the demand to provide clean and potable water to the very deprived and remote villages in Bolivia. A thorough application that demonstrates a good understanding of the situation of the community. The planned community involvement is good, which will help ensure sustainable solutions. The technological solution proposed is appropriate and training provided for operation and maintenance. My only remaining concern is whether the water source volume available is sufficient for the demand. Thank you for the detailed responses to questions.